2 weeks ago I wrote that I planned to try 2 solutions to creating a perfect backyard bird photography studio. One would be purchased and the other homemade. Both would require some customization but my goal was to do this in a manner that would be easy enough for anyone to replicate. 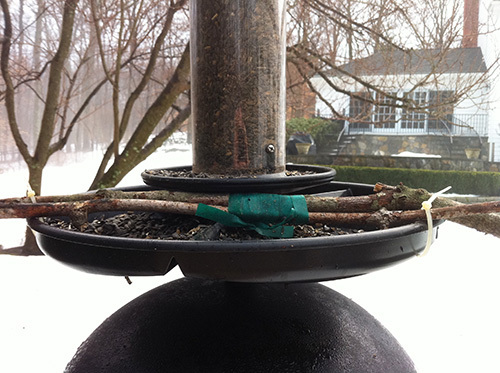 I decided on the “Effortless Bird Feeder” as my purchased option, you can read about it here. So after a few days of using my pimped out bird feeder, I have to say I made the right choice. The results have been truly amazing. I was able to use this combo in the middle of the blizzard we had last week. I will post some of the bird images on Friday but suffice it to say that it held up well to 60 mph winds and 18 inches of snow with 4 ft drifts. Below are some images I made of how I added the perches. Remember, my intention was to do this in a way that any of my readers could replicate with no need for power tools or mechanical knowledge. 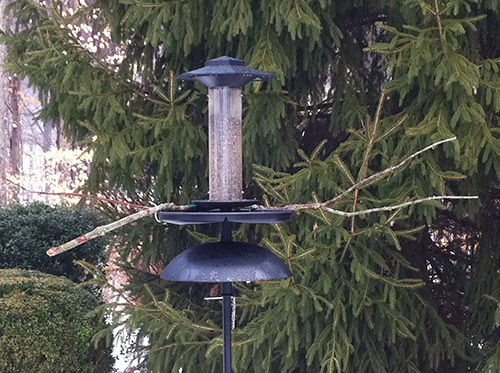 At some point after using the feeder, I might change the perches but so far I have been very happy with the results. 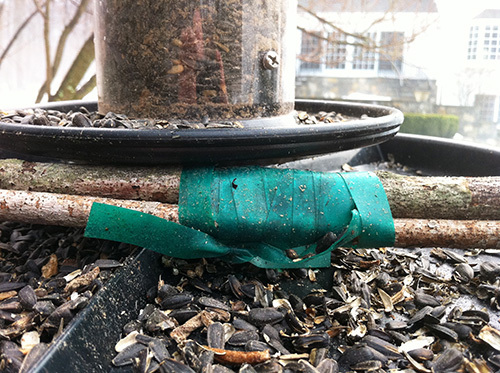 The first thing you need to do is find branches that will make perches suitable to the birds in your area. Below is the back of the unit once complete. These might not be the best pictures of the unit, I only had my iPhone with me when I took them, but I think you get the point. The most important element however is that the birds love it and I have had many different species on the perches in just the first few days. Enjoy making your studio and let me know if you have any other customization ideas for this unit. 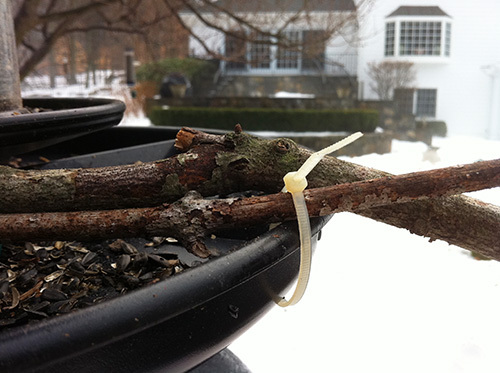 This entry was posted in Birds, Education & Tips on January 5, 2011 by Vincent Mistretta. Love the perched out bird feeder! I’ve been procrastinating about putting up one and this is going to motivate me to get it done. Two questions: Where are you shooting from and what lens do you use? Hi Mike. It has been more fun than even I anticipated, I highly recommend you do it. Its so easy. I am going to make one out of a stump and log soon and post that on the blog as well. All of the pictures are from my yard. I move the feeder around so the perches are receiving the best light and to ensure my background is optimal as I like clean backgrounds. I am using both the 600mm f/4 and the 200-400 f/4 for most of the images. Regardless of the lens, the trick is to get close to the feeder and don’t move around much. No straps hanging down from the camera either! Once you are situated, the birds will return to feed. Sometimes it takes 10-20 minutes for them to return however. Hope this helps.